Approximate packed dimensions: About size of a standard Nalgene bottle but can be compressed further. I used this hammock around home in Virginia several times just to get to know the hammock. After all the trees in the backyard are strikingly similar to ones in the piney woods. The hammock was tested in the woods of south west Virginia during late fall early winter. The weather was cool and sometimes a little drizzling rain. The hammock material can shed light water and seems to dry quickly when the weather warms up. This is where this hammock has an advantage over other netted offerings. Many thru-hikers care about weight above all else, and the Half-Zip comes in at a light 13 ounces (without suspension). With the addition of a lightweight suspension, the whole setup can come in at under one pound. At this weight, it is in the market to compete strongly with other hammock thru-hiker netted favorites like Hennessy Hammocks or Warbonnet Hammocks. This hammock is very easy to set up thanks to the included ridgeline, which keeps the sag consistent while providing a spot to hang a headlamp or organizer. This will ensure many consistently comfortable nights. Note: There is an option to purchase the beetle buckle suspension (shown in pics above) with the hammock which makes the setup of the hammock incredibly easy with no need to fuss with whoopie slings or knots. The rings on each side at the head and foot end can be tied out to pull the bug net off the user’s face for those that sleep head-towards-bug-net (my preference) and also prevent excessive sway if the user prefers not to be rocked to sleep. 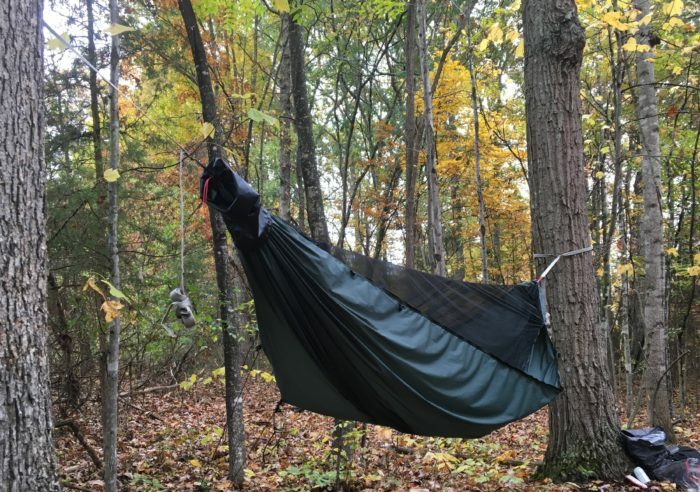 Note: In the video below I have it rigged to use two tie-out points, similar to another DutchWare hammock. On this hammock there is only one ring or tie-out attachment point, but it still works well. Hexon is a very comfortable hammock material. It breathes well and is comfortable to sleep in even if you want to sleep sans shirt and/or pants (do your thing). Dutch and his army of seamsters in Pennsylvania do an excellent job hand-making every hammock. The stitching on this hammock, as well as other items I have received from DutchWare, is top notch. Once there is more field experience on the long-term durability of the proper use of Hexon 1.0 in the field, this concern may be an afterthought. If this is a concern to you or you are close to the weight limit for the hammock, bump up to the Hexon 1.6 (350# weight limit) its heavier but its also an excellent material and an available option for the half-zipped. I used a hammock of this material for hundreds of( if not 1,000) miles on the AT and it held up very well. A ridgeline organizer would increase the ease of use of this setup. Having a spot to stow headlamps, ear plugs, or other small items would round the package out nicely. Luckily, Dutch has organizers for sale separately. I would recommend the DutchWare Half-Zipped hammock for anyone from thru hikers to backyard loungers. This is a light ,comfortable, and affordably priced hammock setup that I wouldn’t hesitate to take on a long trip tomorrow. In addition to all of the items discussed above, Dutch and his team have amazing customer service—especially for thru-hikers. After all, Dutch thru hiked the AT in 2003. The only place to get the hammock is from Dutch himself (link below) and it is competitively priced with other alternatives. If you order one make sure to let Dutch know you found out about it on this site and you are planning to take it on your thru hike. I love it and totally agree. Dutchware is in the city I live in. Stopped to see his shop and he gave me a tour. Very big on making versatile gear that doubles as something else to shave weight. I have their halfwit and Hammock Gear’s top quilt and underquilt. Both super companies to work with. Great to hear you like Dutchware’s gear. Dutch is a master of his craft and I’ll be one of his customers for a long time to come.